One evening last week, I was washing dishes after dinner. I noticed our baking sheets, that are barely 2 years old, don’t look “new” anymore. Their fresh-from-the-store shine is now dull. They have scratches like road maps. Grease stains, discolorations, and an imprint from a recent “very crispy” dinner. When I first noticed their newness was missing, I was sad. Drew and I celebrate two years of marriage this August, we received these baking pans as gifts. I immediately felt guilty – like I had been too rough with our baking sheets. On our recent cruise, Drew and I attended a newlyweds game show with every intention of participating if selected. However, when we arrived, we found out that we hadn’t been married long enough, but we also weren’t “new enough” to participate in the show. 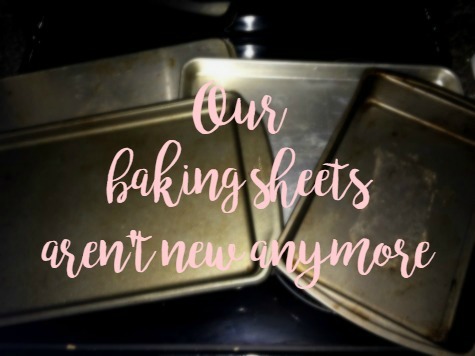 I felt sad then because we were no longer considered new, and that feeling crept into my heart when I saw those (no longer new) baking sheets. What a blessing it is that our baking sheets aren’t new anymore. Our scratched and scuffed baking sheets are evidence that there has been love in our home as we’ve wanted to cook and eat together. The shine was dulled each time Drew continued to pursue my heart, by making me dinner after a long shift. Each time I experimented with a new recipe, hoping Drew would love it, our baking sheet received another scratch, a tick mark, reflecting another smile on his face. We have longed for time spent at home over delicious meals. We’ve made sharing dinner time a priority. We have eaten wonderful home cooked meals together and our not so new baking sheets are a sign of that. These now dented baking pans are proof that we have lived in a house with electricity, and always had enough to put food on the table. Our stained baking sheets are evidence that our basic needs have been met over the past couple of years. You could tell by looking at our baking sheets, that we’ve not went hungry. The collection of “damage” we’ve succumbed these baking sheets to reveals that the contents of our fridge were never empty. Our hearts and bellies have been full, as evidenced by the baking sheets that no longer shine. I’m sure there are families that wish their own baking sheets had a little more stains and a little less sparkle. Our baking sheets are also a reflection of our marriage. New and shiny at first, and then the scuffs and stains along the way, make them all the more charming. Each scratch, a memory etched in time. They’ve survived even the saltiest of my cooking fails, at the same time our marriage has endured my salty comebacks. And while the gleam of freshness may have worn off, those baking pans, like our marriage, are just as beautiful as the day they were presented to us. Even if the newness of the baking sheets has rubbed off, they’ve been well loved. And like baking sheets, the scuffs, bangs, dents, scratches, and stains that have occurred in our relationship tell a delicious story about who we are and what we cherish. An artifact for years to come from the first year and a half of our marriage. Trust me, these baking sheets aren’t being replaced anytime soon. And while many people would wish you a marriage free from dents and scratches, I won’t wish you that, because I know it is not realistic. Instead, I wish for you to see those stains and discolorations and love them even more for their imperfections. Here’s hoping the sparkle on your baking sheets wears off real soon. Are your baking sheets well loved? What stories do they tell? I see you. I see you clogging through the halls in your danskos. Your hair perfectly styled at the beginning of the shift has since been pulled into a messy bun. I see your pocketful of pens and highlighters. I see you analyzing labs and planning interventions. I see you predicting outcomes and calling doctors. I see how you interact with patients and make them laugh and smile. I see you. 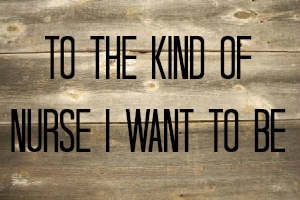 And in you, I see the kind of nurse I want to be. I see my own pair of scuffed white nursing clogs, my own ponytail, my own pockets filled with my own favorite pens. I see you and I dream of having the instincts you have to analyze labs and predict outcomes. I pray that one day my hands won’t shake when I dial the number of a physician in the middle of the night. I hope that my patients respond as well to me as they do you. I see you, and I want to be you. I see you, and I hope you see me too. I hope you see that this world is so new to me, so startling and surprising but somehow also magical. I hope you see that my eyes are wide in anticipation to learn and grow. I hope you see me trying my hardest and doing my very best. I hope you see that I’m still learning, but that I never want to stop learning. I hope you see that I care. I hope you see me. I hope you see me, and I hope when you see me, you see yourself. I hope you see your own brand new scrubs and new danskos. I hope you see the first time you ever truly understood the meaning behind lab values. I hope you see yourself the first time you didn’t have to google the name of a generic drug to remember it’s trade name. I hope you see me and see your own first victory dance after a series of successful IVs. So to the kind of nurse I want to be, when you see me, I hope you’ll smile and encourage me. Teach me something that will make me better. Don’t expect me to know it all, but do have high expectations of me. Let me take the lead every now and then. Let me show you how much I know. When you correct me, do it with kindness. When I make a mistake, show me the correct way to do it for next time. Share with me everything this profession has given to you, I’ll hang on to every detail. Don’t leave out a thing, I’m listening. I see you, and I hope you see me, too. You’re the kind of nurse I want to be. Don’t forget that. It’s hard to believe that this time 2 years ago, some of the most important people in my life today, hadn’t even entered my life yet. 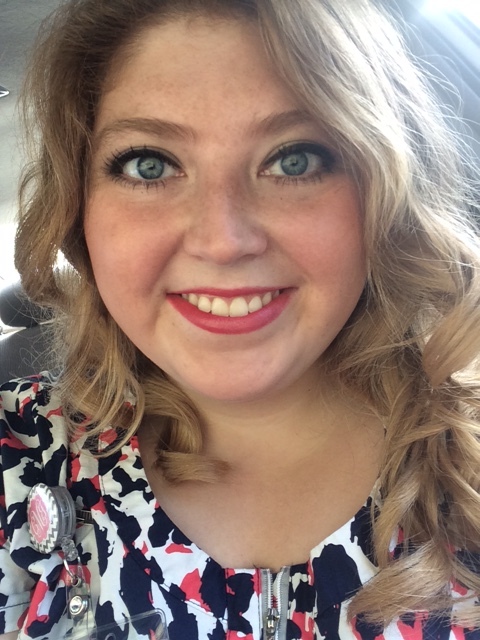 When I started Nursing School, I had anticipated (hoped!) to make a lot of good friends, but I didn’t realize just how crucial they would be to my success in school, and my joy. I’m absolutely blessed to be a part of a class that is incredibly tight knit and supportive. I know my classmates are the best, because they have the hearts of future nurses – compassionate, kind, and intelligent. I’m just lucky that I get to know these people. 1 – They get it. 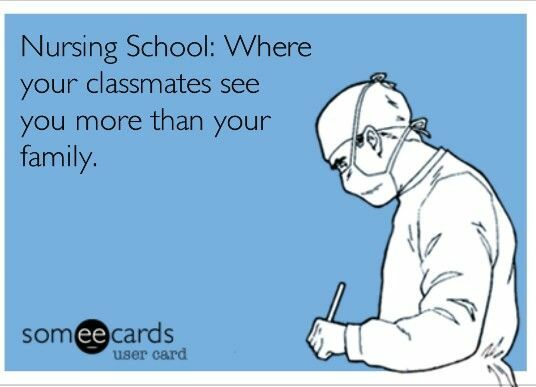 Nursing School (and Nursing as a profession) is demanding, difficult, exhausting, and often grueling. Lucky for me, I’ve had 9 other people that understand exactly what I’m going through., because they’re going through it with me. Whether it’s the demand of balancing a full class schedule with work, feeling like a failure when you see an exam grade, or feeling like you may vomit the first day of clinical, they understand it. They’re always there to rant with you, cry with you, and support you. And the first people you want to send a picture of your new stethoscope to. 2 – They’re helpful. I’ll never forget my first day of clinical. I truly thought to myself, “I’m not cut out to be a nurse.” My first patient was bed-ridden, nonverbal, and in contact precautions. While I had envisioned a day of head to toe assessments over coffee and conversations about grandchildren (in a perfect world, right? ), my reality was far from my expectation. And I had no idea how to interact with a patient in this condition. Thankfully, a classmate came to my rescue and led the way. Another time at clinical, I experienced my first “Code Brown”, thankfully, I had a group of friends bearing supplies that were great sports about helping. If not for my classmates, I likely would have failed my first clinical experience. I was a fish out of water. Also, classmates make the best study buddies and will usually share their lunch. Thanks for the help, guys. 3 – They make you laugh. When the going gets rough, the tough get silly. I remember being so upset and anxious, and belting Nicki Minaj over lunch instead of studying. (They don’t call me Cassie Minaj for nothin’.) There was another time when we were in a short car heist, (Don’t worry, Mom, we were wearing seatbelts! ), and the time I pranked a teacher, and the many Granny Rhoda stories, and the time Greg finally got facebook, and the time David accidentally proposed to Sydney, and the time Jess defined the word “naked”, and hearing over and over about Deonna’s terrible driving, and the list goes on and on and on. . . In short, when I could have cried because I was stressed, I had tears from laughing too hard instead. 4 – They share your goals. We all started the program two years ago with one goal in mind: RN. The fact that we all share this goal and mindset allows us to push each other and support one another. When anyone is having a rough time, they are quickly reminded that they aren’t allowed to give up. Time and time again, we are reminded why we started this journey, and encouraged to finish it together. When a group shares one goal and pushes toward it together, the results are amazing. I anticipate my class will be no exception. 5 – They become your own personal team of nurses. “Don’t worry, it’s probably just heartburn, no way it’s a PE.” In nursing school, you learn about a million different things that can go wrong in the human body. And then you convince yourself time and time again, that you have any combination of those ailments. There’s a good chance my class may be the absolute worse for that. Thankfully, we constantly remind each other that our list of absent symptoms is way longer than the list of present symptoms. And if you’re not feeling well, who better than to take care of you? Or put you in quarantine because you have strep throat and we have clinical that week? Seriously though, nursing friends are awesome because they can often tell you’re feeling bad before you’ve even recognized it yourself. Love those assessment skills. I’m so thankful for the incredible group of nurses I’ve had the pleasure of spending the past two years with. Now that these people are in my life, I can’t imagine life without them. I hope your group of classmates is just as wonderful and loving and hilarious as mine is. Every nursing student deserves to have the love and support that I’ve received from my nursing friends. 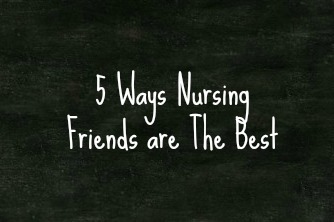 What makes your nursing friends awesome? Are you blessed to be surrounded by classmates that build you up?